The film is on my list of my most anticipated movies of the year, and it's also one of the films we listed as the 21 Movies You Can Still Look Forward to in the Second Half of 2013. 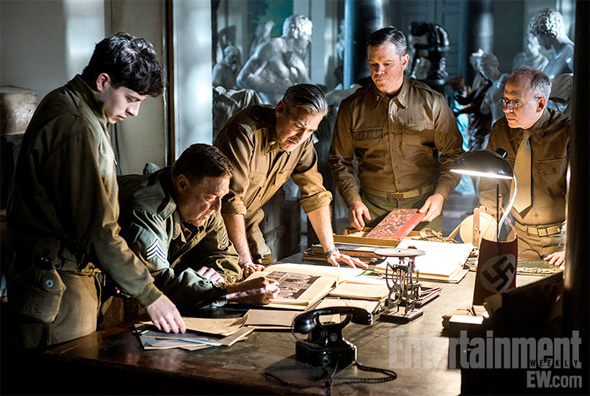 Now a first look photo has finally arrived from The Monuments Men, directed by and starring George Clooney. The story follows a crew of art historians and museum curators working together to recover renowned works of art stolen by Nazis before Hitler destroys them as his defeat draws nearer. In the photo, Clooney is on the hunt along with John Goodman, Matt Damon and Bob Balaban. Stay tuned for the first trailer coming this Thursday! The Monuments Men is directed by George Clooney (Good Night and Good Luck, The Ides of March) who co-wrote the script with his producing partner Grant Heslov. An adaptation Robert M. Edsel's book of the same name, the film follows the true story of a hand-picked group of art experts chosen by the U.S. government to retrieve artwork stolen by the Nazis. Clooney also stars in the film along with an impressive cast including Matt Damon, Cate Blanchett, Bill Murray, John Goodman, Jean Dujardin, Bob Balaban and Hugh Bonneville. Columbia Pictures releases the film on December 18th late this winter. Sound good?